Cheryl Thomas - Cheryl is an independent business owner located in Clearwater. Cheryl has been an active supporter of the North Thompson Communities Foundation since it’s inception. Being a Great-grandmother, grandmother, mother and wife are paramount reasons for Cheryl’s concerns for attaining a viable future – both monetary and physically sustainable – for future generations of North Thompson Valley residents. Cheryl also sits on the finance, and information & communication committees and joins in many of the working group as they go about promoting the Foundation. “When you feel you are contributing, in even the smallest of ways, to support the future generations, you’re able to feel ‘on top of the world’ with pride and gratitude for those other community members who are sharing the dream’’. Lisa Leger - Lisa is originally from Victoria B.C. and currently resides in Avola. She has volunteered with various social and charitable organizations through the course of the last 15 years. Her interests include organic, heirloom gardening, spiritual growth, travelling, and outdoor adventure. Lisa is also the chair person for the Avola Community Hall and Recreational Cooperative Association and keenly supports local Community Development within Avola and the North Thompson Valley. Additionally, she advocates animal rights, human diversity and a healthy , sustainable environment . Gilles Leger - Gilles has been a resident of Avola for 13 years. He loves to garden and grow organic heirloom vegetables and garlic. Additionally, he has a heart for the less fortunate and supports several social programs. In his youth Gilles ran a Drop-in Center for the homeless in Portland, Oregon. Currently, he is actively involved with the Children's Ministry at his local church. He is a positive influence within his community and a board member of the Avola Improvement District. Gilles enjoys travelling, playing music, leatherwork and cooking. Franz Friesinger -2017 Chair Franz was born, raised and educated in Munich, Germany. He immigrated to Canada in 1975 where he was employed as a cabinet maker in Montreal. In 1979 he moved to Calgary, Alberta where he owned and operated a custom woodworking shop until his retirement in 2006. While in Calgary he ran a crime prevention program for Foothills Industrial Park. Being a resident of Barriere he is involved in the Garden Club, the North Thompson Recreational Society and the North Thompson Community Choir. The North Thompson Valley’s future is of great importance to him. Sandra Wetterstrom - Sandy Wetterstrom is a new arrival to Clearwater. She is married and has two sons and one grandchild. Born and raised in Vancouver she graduated from UBC. After a summer job tree planting near Prince George she never returned to the city and spent the next thirty years in the Robson Valley. She met and married husband Mike in August 2003 at the family home in Darfield and witnessed the devastation of the wildfires that summer. Work took them north to Houston where Sandy combined her two interests, adult literacy and gardening, into a job with the literacy organization, Houston Link to Learning. As the Coordinator of the Houston Community Garden she worked with all ages and groups to provide a safe, inclusive space to learn about growing and harvesting food. She held this position for four years until her move to Clearwater. While in Houston, Sandy was actively involved in the community. 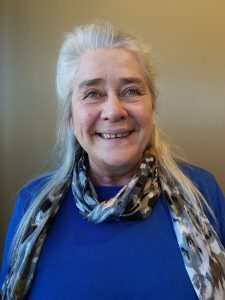 A founding member of Healthy Options for People and the Earth Society, she initiated the Nutrition Coupon Program for the Pleasant Valley Community Market. Sandy is looking forward to establishing a garden, participating in the Clearwater Farmers Market and becoming involved in her new community.